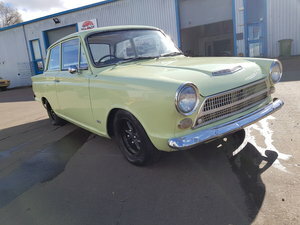 Here is my magnificent 1964 Ford Consul Cortina Mark 1 estate. Wow, that's quite a mouthful when you read it back! Well, what do we know? 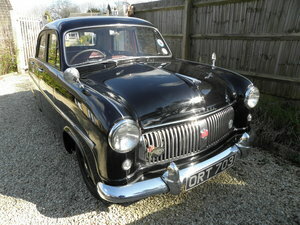 Firstly, let's put the emphasis on the name Consul as this proves what an early and rare bird this really is. 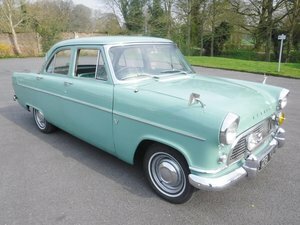 The original Cortinas were indeed badged as the Consul Cortina, although this was phased out later in 1964. 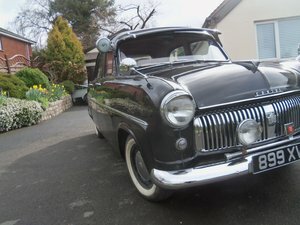 You will note the very early style front grille with the white sidelights/indicators separately positioned. Other subtle early features include the somewhat weird indicator control on the right hand side of the steering column. The obvious giveaway of an early pre-airflow Cortina is of course on the opposite side of the wheel where we have the 4-speed column change. This, by the way, works admirably and is a delight to handle. Originally, this car was equipped with column change and bench seat. I still have the original front bench seat as well as rear fold-down seat. Both bases show some splitting but both back rests are fine. They could be easily repaired and re-instated. Now, more on the car. She is listed on her V5 as being a 1200 deluxe (1198c), although one of her previous owners (and she has only had two before me!) 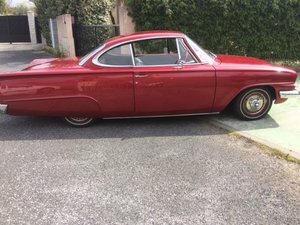 clearly decided to treat her to chrome side strips, at this time fitted to 1500 Supers only to allow for the contrasting colour flash, as well as a Mark 1 1500GT dash pod. The 1200 would have come with the long thin horizontal-style speedo. All this works very well in my view and I have to say that she drives like a dream. Cruising in top gear today, I would have accepted it if someone had told me I was driving a 1500 as she goes that well. But for now, we shall have to take it as read that is a 1200cc. Panels are great and she is an absolute delight under the bonnet with un-touched strut tops and no repairs in there whatsoever. 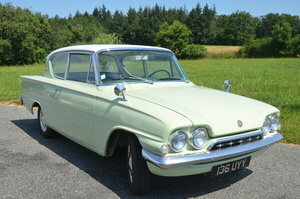 She appears to be mega-strong underneath too and really is an all round belter of an early 60s classic. All my classic cars are treated as the equivalent of motoring antiques. This one, for example, is 55-years-old this month! They cannot be compared to the wife's six-month-old Chelsea tractor and they are bound to come with imperfections, quirks and bits and pieces that will need attention even if it is some time in the future. They do however come with oodles of charm, appeal and are there to be loved like a family pet. If you are new to the classic car scene, then please bear all this in mind. Most examples have clearly had work over the decades and I cannot predict how much or how little they will need in the future. That, I am afraid, is the nature of the beast in the world of classic cars. Motoring antiques is what they are. I love my Georgian dining table, but I can see all the scars and signs of previous woodworm. Had I wanted a brand new table, I would have gone to Oak Furniture Land. Well perhaps. Demand is outstripping supply these days and they don't make the old girls any more. So, make some allowances and drive away with a smile on your face. It goes with the territory, and therefore must be accepted, that they are always going to need on-going care, attention and repair. Don't tell me some way down the line that the full beam doesn't work or that you have discovered something I knew nothing about. They are bloody old. It happens. They come in and they go out. It seems as though I have become a "re-homer" of classic cars. I accept all major debit cards and a ten per cent deposit is required at the point of sale with the balance due within three days. I can also assist with delivery and so please ask for a quote. Thanks for reading, Martin. (07595-020282).